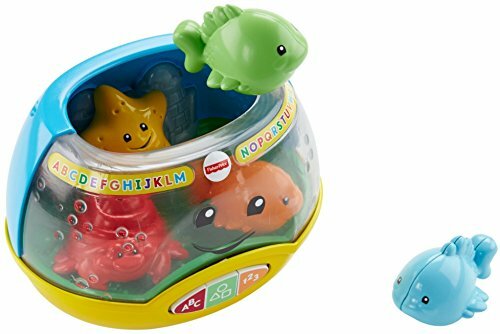 Get ready for learning fun with a motion-activated, "magical" fishbowl that lights up and plays songs when little ones put and take their aquatic friends in and out of the bowl! With a wibbly-wobbly base, a light-up castle, and three colorful buttons that teach the alphabet, shapes and numbers, this fishbowl will keep your little one playing (and learning) all day long! Where development comes into play: Curiosity: As babies discover how to activate the lights and sounds by moving the toys in and out of the fishbowl, they learn that their actions can make fun things happen—a perfect introduction to cause and effect! Fine motor: Grasping the fish and putting them in and taking them out of the fishbowl and pressing the buttons helps strengthen hand-eye coordination and dexterity.